Creative Excellence Award winner TASSIE CAMERON, Screenwriter & Producer, was the first to drop by and share her stories, next was LISA MEECHES, Executive Producer, President, Eagle Vision Inc., Meeches Video Production Mentorship Award followed by Outstanding Achievement Award winner CHRISTINE SHIPTON, Senior Vice President, Drama/Factual Content, Canwest Broadcasting. All the award winners are a testament to hard work, passion, and creativity. And finally, the lady the legendary, iconic Canadian actress of film, TV and theatre SHIRLEY DOUGLAS, International Achievement Award winner who truly captivated us with her charm and wit. https://www.thewineladies.com/wp-content/uploads/2017/09/LifestyleShirleyDouglass.png 493 456 Susanne Seelig-Mense https://www.thewineladies.com/wp-content/uploads/2017/08/WineLadiesLogoTransparent.png Susanne Seelig-Mense2009-12-07 12:00:012018-02-09 23:11:05Lights, Camera, Action! 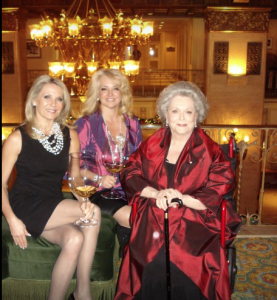 The Wine Ladies launch new web TV "One Sip At A Time"!